"Buffalo Bill" presents a workshop on Indian Sign Language. 2) In the winter time, a form of entertainment among the Indian people was storytelling, and many of the storytellers would talk with their hands when telling their stories. 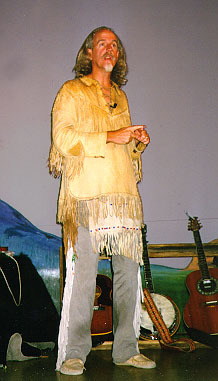 Buffalo Bill utilizes some Indian Sign Language stories in his full length music presentations Legacy of the Wild West, History of the Wild West, and Oregon Trail. In this workshop he presents a more in depth study of the the hows and whys of Indian Sign Languge. "Will you and I go hunting buffalo?" ie: "I want to talk the long talk". to follow along by performing the signs themselves (imitating "Buffalo Bill"). Students will learn to tell a short story using tradition Indian Sign Language, and some will tell a story to their friends and classmates. "Buffalo Bill" Boycott lives in Lander, WY next to the Wind River Indian Reservation and learned Indian Sign Language from a elder Shoshone tribal member. He learned this storytelling in the traditional way, person to person.